How do I align the print head? Load a sheet of paper in the printer. Press SelecType on the printer's control panel. You see PRINTER SETUP. Press until HEAD ALIGNMENT is selected, then press . You see PAPER THKNS. Press to select STD. This is the correct thickness setting for most Epson papers. Press to select the mode you want to adjust: BI-D BLACK, BI-D ALL, or UNI-D ALL. If you're printing non-photographic images with black ink only, select BI-D BLACK. Otherwise, perform a UNI-D ALL adjustment, followed by BI-D ALL. Press Enter to print the alignment patterns. 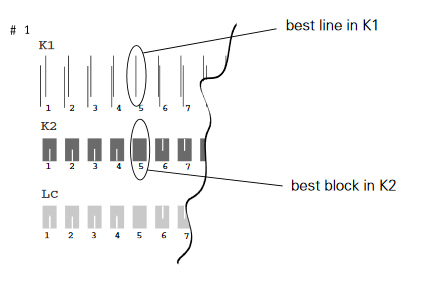 Once the patterns are done printing, examine the first row (K1) in group #1. You see a pattern similar to that shown below (only part of it is shown in the illustration). Use an eye loupe to determine which line looks the best. In the example below, the middle line (number 5) is the best. Note: You must use at least a 10x eye loupe to check the pattern. Press or to select the best line. Examine the black set of blocks (K2) in group #1. Select the block with the smallest gap, then press Enter. Repeat this process for each of the other patterns when prompted. If number 5 (the current alignment setting) shows the smallest gap for each pattern, the print head is aligned and you can exit the adjustment early by pressing Pause. You may need to repeat the alignment more than once to ensure that number 5 is the best choice for all patterns. Press Pause to exit the head alignment mode.